Egypt’s Culture Ministry on Sunday explained for the first time why it banned Ridley Scott’s biblical epic “Exodus: Gods & Kings”, claiming the movie presents a “racist” image of Jews, reports The Associated Press (AP). The ban was announced several days ago, but Sunday’s statement from the Culture Ministry marks the first time that the reason for the ban was officially explained. According to AP, the statement said the film put forth a reading of Egypt’s history that is at odds with the story of Moses told by the world’s monotheistic religions. The ministry said the movie inaccurately depicts ancient Egyptians as “savages” who kill and hang Jews, arguing that hanging did not exist in ancient Egypt. It further said the film also presents a “racist” depiction of Jews as a people who mounted an armed rebellion. The ministry said religious scriptures present Jews as weak and oppressed. The ministry said it had convened two committees — one of censors and one of archaeologists — to review the film. The committee of archaeologists agreed with the decision to ban the film because it showed “a false and wrong mental image of Egypt’s history,” the ministry said, according to AP. According to the book of Exodus, Jewish slaves were led to freedom by Moses after G-d inflicted a series of plagues on Egypt. 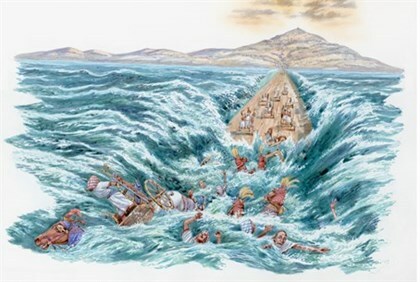 The Biblical story tells how the Red Sea was parted by a miracle performed by G-d, allowing the Jewish people to escape from the pursuing Egyptian army. The banning of the Exodus film follows a similar move in March, when several Muslim countries banned Paramount Pictures’ “Noah”, which told the story of Noah, who survived the Flood by building an ark according to G-d’s word, as related in the Torah. Meanwhile, the United Arab Emirates also decided to ban “Exodus: Gods & Kings.” Juma al-Leem, of the National Media Council, told AP the movie contained historical and religious errors that are not in Islam or in the Bible.